It recently has been learned that Dodger was killed off by his owner, forty-six-year-old Fee Jeanes of Bridport in Dorset, sometime in early February of 2012. Although his death is by now very old news, that in no way makes it either any less sad or revoltingly unjust. 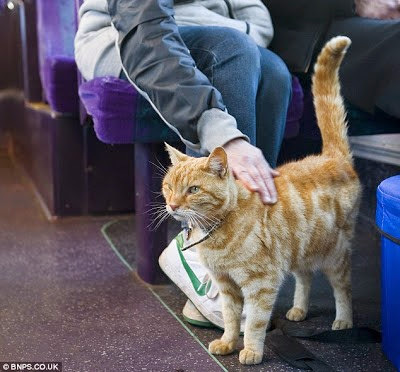 Dodger, as it may be recalled by some, was a friendly and intrepid fifteen-year-old, ginger-colored tom who skyrocketed to international acclaim in December of 2011 when it was disclosed that he regularly rode the mass transit system in Dorset and Devonshire by his lonesome. Most notably, he was regular on First Bus's ten-mile run between Bridport and Charmouth. Jeanes allegedly had him killed off due to the presence of a stomach tumor that he is believed to have been diagnosed with sometime before Christmas of 2011. Since no additional details have been made public, it is difficult to know if the tumor could have been successfully treated with either surgery or some other means. By characterizing the bloodthirsty practitioners' dirty work in such glowing terms she is surely laying it on a bit thick because any idiot, shekel counter, and selfish, lazy bum can kill a cat. By contrast, recognizing that all cats have an inalienable right to live out their lives to the very end, cherishing every moment that they are alive, and being willing to do whatever is required in order to preserve and extend their all-too-brief existences is the first step on the road to true compassion and enlightenment. For whatever it is worth, Jeanes insists that the decision to do in Dodger was anything but an easy one. "It was the hardest decision I have ever had to make," she swore to the Bridport News. "I cancelled it twice." Even if she is being truthful, she likely only demurred because it was Christmas and she did not want to spoil that special time of the year for her three children, Jack, Emily, and William. It is, after all, well known that innumerable cat owners wait until after the holidays before killing off and abandoning their companions. She additionally claims to be broken up about Dodger's demise. "The family are (sic) in tears," she confided to the Bridport News. "Poor old Dodger, it is very sad." Even if her initial grief was real enough she certainly got over it awfully fast because soon thereafter she had graduated to rationalizing his death. "Dodger had a good life," she vouched to the Bridport News. "He was a brilliant cat and was spoilt rotten." Named after the Artful Dodger in Charles Dickens' novel, Oliver Twist, he was renowned for befriending perfect strangers and gracing the laps of commuters. In particular, he is known to have substantially lifted the spirits of a sick woman on the number fifty-three bus by simply sitting on her lap. "He made a lot of people happy," Jeanes told the Bridport News. "The response to him was amazing." Dodger was buried in Jeanes's garden but it has not been disclosed if he was provided with either a memorial service or a tombstone. Jeanes did, however, put up a notice at the bus station in order to let both commuters and drivers know that they had seen the last of him. Normally, that would have been the end of the matter, ashes to ashes and dust to dust as the Anglicans are fond of intoning, but since Dodger was such a special cat and because he had touched so many people his life and, especially, his death are deserving of additional examination. 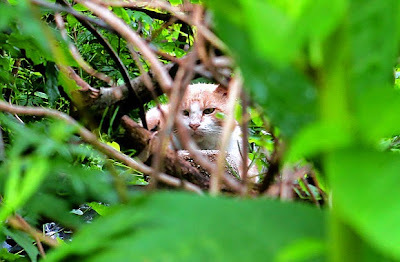 Although it is way too late to do him any good, such an inquiry might one day prove beneficial to other cats who are experiencing some of the same difficulties and challenges that plagued his life. Whereas an occasional sandwich and a pork pie would not have killed him, such a fare was woefully deficient in the nutrients and vitamins that he needed. A far better choice would have been a diet consisting of either commercial cat food or raw meat. Moreover, it is doubtful that he received much of either of those because he was so seldom home. "He is down there (at the bus station) all day and I have to go out in the night to make sure he is okay," Jeanes revealed to the Dorset Echo. Every bit as alarming, there simply is not any way of knowing what he was picking up and being fed at either the bus station or on board the buses themselves. It is even conceivable that he could have been either intentionally poisoned or fed rotten meat. It should be axiomatic that no halfway responsible owner would want her cat to be scrounging around in the street for his next meal. It also is pretty much a sure bet that if Jeanes so flagrantly neglected Dodger's diet, the same likely is true of his personal hygiene, grooming, and the care of minor injuries. It is not even known if she afforded him periodic veterinary check-ups. All of those omissions pale in comparison, however, with her decision to turn him loose to roam both congested West Street and the buses night and day. In addition to the very real possibility that he might have been poisoned, Dodger easily could have been lost, stolen, or preyed upon by ailurophobes. Instead of taking decisive and concrete action in order to have eliminated the myriad of dangers that imperiled Dodger's life, Jeanes instead relied upon her children, the operators of First Bus's fleet of chariots, commuters, and the general public to do her duty for her. Even more appalling, she remained unconcerned about both his safety and well-being right up until the bitter end. "He's absolutely fine," she swore to the Dorset Echo in the article cited supra. 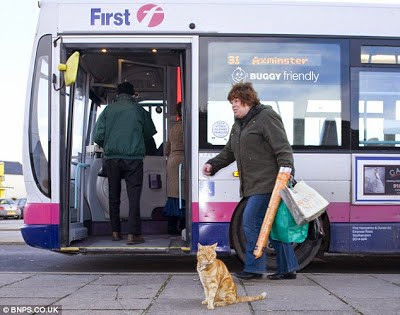 "He comes home and sleeps at the end of my bed and spends the rest of the day at the bus station." With such a laissez-faire attitude toward him, it is not really all that surprising that she had him killed off at the first opportunity that was presented to her. As an added incentive, she furthermore claims that he had of late begun to lose his marbles and that as a result she was getting five to six telephone calls a day from concerned citizens to go and collect him from various parts of Bridport. Not only has she failed to produce so much as a shred of evidence in order to back up her claim, but dementia is not normally considered to be a side effect of leiomyosarcoma. A far more plausible explanation is that Dodger had lost neither his mind nor changed his habits but rather that the increased concern voiced by Jeanes's neighbors was attributable to his newfound fame. It also is not totally out of the question that she, a lifelong hoofer since the age of three, was simply too busy managing the Fee Jeanes Toddlers Ballet on Victoria Grove Street and promoting her daughter Emily's career as a dancer in order to be bothered with the additional responsibilities that came with Dodger's notoriety which, ironically, she knowingly had foisted upon both him and herself. As a consequence, she then cooked up the sottise about him being senile as just one more rationale for having him whacked. Besides, she candidly admits to caring only about hoofing. "It is something I love doing. 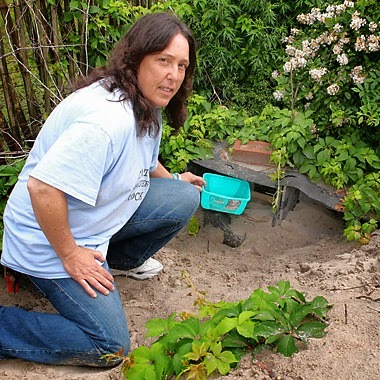 I guess it started as a hobby and has just gone from strength to strength," she proclaims on her web site. "Seeing children having fun, while at the same time learning basic ballet with good discipline and enjoyment is what is important to me." It nonetheless is nothing short of a profound pity that she cared so little about Dodger because he unquestionably was worth considerably more than either hers or Emily's hoofing careers. To put the matter in even blunter terms, he most assuredly deserved far better than a vainglorious shekel chaser for a guardian. 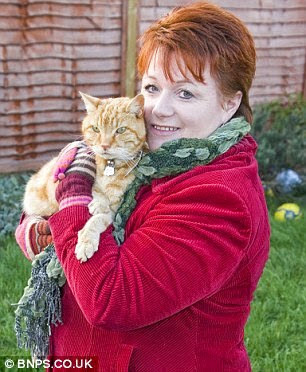 It is utterly outrageous but far too many cat owners are, like Jeanes, strictly fair weather guardians. C'est-à-dire, they dearly covet the unconditional love and companionship that cats offer so long as they neither cost nor trouble them too much. Once their loyal companions become either sickly or simply inconvenient to have around any longer they do not think twice about getting rid of them. As is the case with just about all cats, both the famous as well as those who live out their lives in obscurity, not a great deal is known about Dodger's life. For example, it has not even been publicly disclosed either where he was born or how long that he had lived with Jeanes and her family. Equally important, it would be interesting to know what his life was like before he was relocated to West Street. For instance, did he also roam and ride public transit at his old address? The only thing about him that seems to be relatively certain is that his riding of the buses in Bridport was a fairly recent development. "We moved here nineteen months ago and our house backs on to the bus station," she disclosed to the Daily Mail in the article cited supra. It therefore might not be too far-fetched to conclude that it was precisely the close proximity of his house to the bus station coupled with Jeanes's abject neglect of him that drove him into the arms of the commuters. After that, either one of them carried him on board or otherwise he found his way aboard by himself. Even Jeanes herself admits that it was precisely the siren call of the free food, warm laps, and the attention showered on him by both commuters and drivers alike that attracted him to the buses. That tends to make sense in that it is unlikely that either boredom, Wanderlust, or eros still held much of an appeal for a tom of his advanced years. Nevertheless, the mere fact that Dodger was forced to venture weit und breit in order to procure the nourishment and nurturing that he so cruelly was denied at home is in itself a staggering indictment of Jeanes's misconduct as a guardian. Even more damnable, it very well could have been her neglect of him that shortened his life. No matter how Dodger's short, tragic life is analyzed it is impossible to come away with any other conclusion than that he richly deserved to have been blessed with a far more attentive and caring guardian than Jeanes. By failing to fulfill her solemn obligations to him, she shortchanged not only him but, ultimately, herself as well. "I know a lot of people are going to be very disappointed and saddened that Dodger has gone," she predicted to the Bridport News in the February 22, 2012 article cited supra. That is putting the matter rather mildly in that he leaves behind not only the hundreds of commuters whose lives he touched so profoundly simply through his presence on the buses and at the Bridport station, but thousands of others who learned of his existence via the Internet, the Today Show on Australian television, and the women's weekly magazine, Chat. Even the suits at Whiskas were so impressed by him and his exploits that they once sent him a parcel of treats. Sadly, he is gone now and both Bridport and the world are all the poorer. Even more disquieting, it is too late to recall him from the grave and to belatedly shower him with the love and nourishment that he was forced into cadging in random, intermittent installments from perfect strangers. "We all came down to the reality that no matter how much we fight, these cats are not going to be able to stay where they are." It was a sad, tragic, and outrageously unjust end for thirty-three intrepid and noble cats who for the past eleven years had called Plum Beach in Brooklyn home. As integral parts of a fabulously successful TNR colony, they had weathered all the inclement nastiness that Mother Nature had to dish out, not the least of which were hurricanes Irene and Sandy and the recently bitterly cold winter, as well as having been forced to fend off countless predators, both animal and human. Regrettably, neither they nor their incredibly dedicated caretakers proved to be much of a match for the ingrained hatred and underhanded machinations of the National Park Service (NPS) which has dominion over Plum Beach thanks to its being part of the twenty-six-thousand-six-hundred-acre Gateway National Recreation Area (GNRA). With its twenty-two-thousand glorified and gilded welfare bums who masquerade as public servants on top of an annual operating budget of around $3 billion, this cat-hating behemoth of the Interior Department easily had the volunteers hopelessly outgunned and outspent. All of the cats had been sterilized, vaccinated, and sheltered as well as fed and watered twice a day by the volunteers. Moreover, there had not been any complaints as far as it is known about their presence from either residents of the surrounding neighborhood of Plum Beach or those living in nearby Sheepshead Bay and Gerritsen Beach. "These cats have been there for years," Nancy Rogers of K9 Kastle of Brooklyn told the New York Daily News on June 14th. 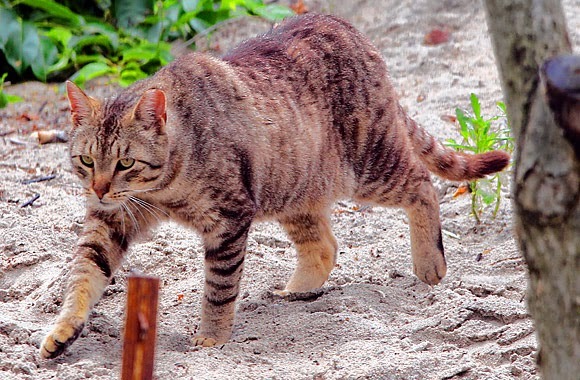 (See "A Colony of Feral Cats Is Set to Be Cleared from Gateway National Recreation Area in Plum Beach on Orders from the Federal Park Service.") "They bother no one." Equally important, they provided an invaluable and cost-free service to the community. "Do you know there's a rat problem in New York City?" Rogers' colleague, Janelle Barabash of Midwood, pointed out the obvious to the Brooklyn Daily on June 13th. (See "Puss Gets the Boot.") "(Do) you know where there's not a rat problem? Plumb (sic) Beach." Being able to see and spend time with the cats also provided a measure of pleasure for those area residents who, for one reason or another, are unable to keep those of their own in their apartments. Even the simple act of just helping these exquisite beings to survive in a hostile world provided immeasurable psychological benefits for some of the volunteers. "It's like therapy for me -- I was in Vietnam," Joe Destefan of Bay Ridge confided to the Brooklyn Daily. "I still go to group (therapy), but this helps a lot." It accordingly came as a profound shock to Rogers and her colleagues when the NPS out of the blue lowered the boom on them and the cats. 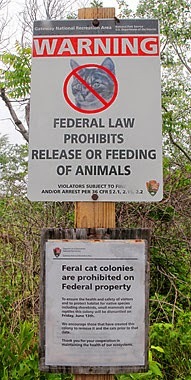 In the typically sneaky, underhanded, and authoritarian fashion that has come to characterize the federal government's abhorrent treatment of cats all across the country, the NPS blindsided the volunteers on June 8th when it posted a sign at the entrance to Plum Beach ordering the cats out of the area. In a carefully calculated maneuver clearly designed to make doubly certain that few, if any, of them would be able to make it out alive, the NPS gave the volunteers only a measly five days in order to remove them. After that, the NPS vowed to destroy their winterized shelters and feeding stations and then to trap and hand them over to shelters. "At this point, our plans are to take those structures down and try to round up the cats and take them to a city shelter," Daphne Yun, a propagandist for the NPS, bellowed loud and clear to the Daily News. While she was at it, she could not resist the overwhelming temptation to claim that none of the felines would be harmed. Rogers quickly responded by exposing Yun as a barefaced liar. "They (the cats) get five days before they put them down," she told the Brooklyn Daily. Although during his twelve-year tenure as mayor of New York City, Mike "Dirty Bloomers" Bloomberg often blew long and hard about transforming the pet slaughterhouse capital of America into no-kill, he did almost nothing in order to make that ideal a reality. His successor, phony-baloney and loudmouthed Bill de Blasio, is an even bigger joke as a public servant in that he behaves as if he were totally ignorant of the fact that scores of cats, dogs, and other companion animals are being systematically exterminated every day of the week at city shelters by Animal Care and Control. Much more to the point, since the parking lot and green way which provide access to Plum Beach are under the joint control of the city's departments of Parks and Recreation and Transportation, de Blasio could have leaned heavily on the NPS to have allowed the cats to stay. Failing that, he could have designated a portion of the parking lot as their sanctuary. The NPS most assuredly could have been dealt with but that is way too much to expect from a inveterate blowhard and bum like de Blasio. Besides, he is far too busy vacationing in Italy and hobnobbing with the sleazy, lower-than-dirt Clintons to ever be troubled with life and death matters and animal cruelty issues. As for the NPS, its rationale for ousting the cats is every bit as old and tiresome as it is disingenuous. First of all, it claims that they are a threat to shorebirds, small mammals, and reptiles. Secondly, it maintains that they are an invasive species and therefore do not have any right to exist in any of the fifty-nine parks and three-hundred-forty-two national monuments, conservation areas, and historical sites that it has appropriated as its own private fiefdoms. Finally, it claims that their presence on federally-controlled property is illegal. "For a national park to have any exotic species that could pose a threat to native wildlife is in direct conflict with national law," the agency's Doug Adamo pontificated to the Brooklyn Daily. "It is conservatively estimated that one billion birds (are) killed by domestic cats in the United States alone." Local ornithologists were beside themselves with glee at the unexpected coup delivered to them on a silver platter by their comrades-in-arms at the NPS. 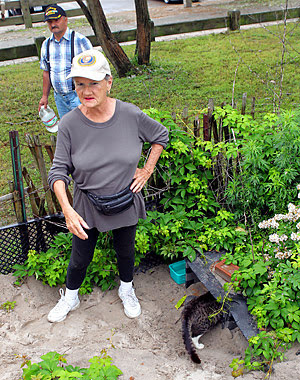 "I would hope that the colony caretakers and the Park Service could work out a plan to relocate the cats that live currently at Plumb (sic) Beach to existent colonies that are not in such an environmentally sensitive area," Rob Bate of the Brooklyn Bird Club chirped to the Brooklyn Daily. "The littoral zone and salt water marshes along coasts are severely diminished habitats worldwide and deserve special consideration, protection and attention." With her beloved cats reduced to living under a death sentence and time running out fast, Rogers was left with no alternative other than to crawl to Adamo on her hands and knees in order to beg for additional time. "It took a year and a half to trap and spay or neuter the population," she pointed out to the Brooklyn Daily. "I don't know how Doug thinks we'll do this in eight (sic) days." In between savoring the sweet smell of victory occasioned by his finally having Rogers, her colleagues, and the cats at his mercy, Adamo somehow still managed to find a teeny-weeny bit of space in his cold, black heart in order to be generous. He accomplished that léger de main by first extending the eviction deadline to June 20th and then, reluctantly, to June 30th. What a guy! That act of beau geste provided the cats' caretakers with a little breathing room but it in no way mitigated the enormity of the task that lay before them. All thirty-three cats had to be trapped and then temporarily housed in Rogers' garage before being permanently relocated elsewhere. Left unanswered, however, is the disquieting issue of whether she ultimately was successful in her attempt to trap and remove all of the cats. The only thing that is known for certain is that she trapped at least twenty of them. "These are the hard ones -- the holdouts," she admitted to the New York Daily News on June 30th. (See "It's End of Feline (sic) for Brooklyn Cat Colony.") "I have two that have been staring at me all morning." Unless the June 30th deadline was extended, any cats that Rogers and her colleagues left behind surely would have been rounded up by the NPS and either liquidated on the spot or turned over to Animal Care and Control to kill. Plus, just because Rogers and her assistants have been given the bum's rush in Plum Beach that does not mean that Brooklynites are about to mend their ways and discontinue using the area as a convenient spot to dump their unwanted companions. "New ones are going to show up to take their place," Rogers sagely pointed out to the Daily News in the June 14th article cited supra. "That's just the way it works." With Rogers and her helpers no longer around to protect them, the NPS will be able to do with the cats as it not only sees fit but to its sinister delight. Rogers may have saved some of the cats through her herculean efforts but the real killing has yet to begin. "We all came down to the reality that no matter how much we fight, these cats are not going to be able to stay where they are," is how she summed up her decision to throw in the towel to the Daily News in the June 30th article cited supra. In addition to all the back-breaking work involved in capturing the cats, they also had to be seen by a veterinarian in order to make certain that their vaccinations were up-to-date before the farm would accept them. They also had to be transported to their new home and Rogers and her colleagues likely are responsible for the cost of their continued care. 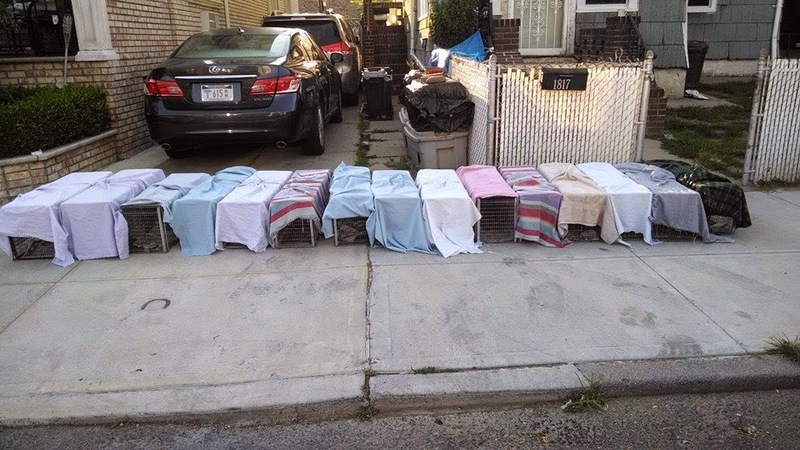 As best it could be determined, no animal rights group either within or outside of New York City was willing to lift so much as a lousy finger in order to help the volunteers save the cats. An online fundraiser at www.youcaring.com/medical-fundraiser/save-the-plum-beach-cats/192464 did succeed, however, in taking in $2,535 of the projected $3,000 needed in order to relocate them. Even though the NPS was able to prevail without so much as breaking a sweat in this latest confrontation between the massive and utterly tyrannical federal bureaucracy and cats, it nevertheless is of paramount importance that its outrageous lies are not allowed to go unchallenged. In addition to Yun's whopper about shelters in New York City not killing cats, the NPS failed to offer up so much as a scintilla of evidence that they were having an adverse impact upon birds, small mammals, and snakes. Old Birdie Bate is likewise lying through his rotten teeth when he blames cats for the destruction of coastal zones around the world. Au contraire, it is precisely developers, polluters, oil and natural gas extraction companies, the United States Navy, and man-made climate change that are the real culprits. On Plum Beach, for example, water and wind erosion are major dilemmas. Moreover, such damage is destined to only grow worse unless drastic measures are immediately undertaken in order to lessen the likelihood of another major storm such as Hurricane Sandy. Neither the feds, birders, nor wildlife biologists want to hear so much as a syllable about climate change and the likelihood that it is destined to obliterate life as it is known on this planet; instead, they much prefer to demonize and kill cats. After all, such a perverse and dishonest agenda not only presents them with an unlimited number of opportunities in order to slake their thirst for feline blood but it also puts enormous sums of money in their pockets as well. Thirdly, Adamo's branding of cats as an exotic species constitutes the very epitome of dishonesty and hypocrisy. Carried to its logical conclusion, his sottise would make not only him and his colleagues at the NPS members of an exotic species but also hundreds of avian and mammalian species as well. All immigrants, foreign visitors, imports, and even ballast water from cargo ships also would fall under that rubric. So, too, would deadly communicable diseases, dozens of varieties of bedbugs, and insects contained in fruit, vegetables, wood products, and other items but absolutely no one, especially the feds, wants to curb their importation. Why, just a few days ago the Centers for Disease Control and Prevention in Atlanta went out of their way in order to introduce the Ebola virus to North America. To this very day, however, neither the NPS nor its sister agency, the Bureau of Land Management, has been able to muster enough moxie in order to evict a herd of cows owned by Nevada rancher Cliven Bundy from federal land even though the animals are an introduced species and he has not paid so much as a red cent of the paltry grazing fees that they have assessed him since 1993! Unlike the cats' law-abiding and peaceable caretakers in Plum Beach, Bundy and his militiamen are armed to the teeth and the NPS starts to tremble in its silk drawers at even the thought of coming within ten feet of them. The picture is thus clear. In the feds' twisted minds, deadly diseases, imported and genetically modified species, farmers, ranchers, mineral extraction companies, illegal immigrants, criminals, and even potential terrorists are welcome on these shores; cats, however, must go. In contradistinction to the vast majority of those species and individuals, the cats from Plum Beach and elsewhere were born here and it therefore is their birthright not only to exist but to flourish in this country. In addition to the many benefits that they bestow upon society, their impact upon the environment is minimal when compared to that of man and other species. The appalling disingenuousness of the distinction that ornithologists and wildlife biologists make between native and so-called introduced species is exposed for what it is once it is realized that the feds routinely evict and slaughter in droves even those species that they have designated as native, such as jaguars, cougars, bobcats, wolves, foxes, bears, coyotes, prairie dogs, and geese. All totaled, the USDA's Wildlife Services kill up to four million wild animals each year at the request of primarily economic interests and cat-haters. (See Cat Defender posts of September 15, 2005 and May 21, 2009 entitled, respectively, "United States Government Exterminates Millions of Wild Animals at the Behest of Capitalists" and "Macho B., America's Last Jaguar, Is Illegally Trapped, Radio-Collared, and Killed Off by Wildlife Biologists in Arizona," the Washington Post, December 15, 2013 and April 24, 2014 entitled, respectively, "Petition Targets 'Rogue' Killings by Wildlife Services" and "USDA's Wildlife Services Killed Four Million Animals in 2013; Seen as an Overstep by Some," and The Star Ledger of Newark, March 23, 2014, "Port Authority Animal Killings in New Jersey Have Little Effect on Bird Strikes, Data Reveals (sic).)" In spite of all of their hypocrisy and blatant dishonesty, ornithologists and wildlife biologists bandy about the terms exotic and invasive just as if they suddenly had arrived at some stupendous intellectual insight. Much like the doped-up followers of some religious fanatic, these wild-eyed egomaniacs tingle from head to toe at their own cleverness but at the same time are flummoxed to understand why the world does not fall at their feet in recognition of their overwhelming genius. Adamo's assertion that cats are forbidden by law to venture onto federally-controlled lands is dubious at best. Although the feds often cite the Endangered Species Act of 1973 and the Migratory Bird Treaty Act of 1918 as granting them the authority to evict and kill cats with impunity, both of them were enacted long before TNR became en vogue and it is extremely doubtful that their drafters ever envisioned that they would be put to such an evil purpose. The feds' draconian attitude toward cats is therefore merely a bureaucratic policy and not a federal mandate. As such it could be overturned by either the president or Congress exercising its oversight authority. Besides if it were the law of the land, every ornithologist and wildlife biologist in the country would have been in federal court long ago demanding that it be rigorously enforced. Since that is hardly the case, they have been reduced to lobbying Barack Obama's latest flunky at the Department of the Interior, Sally Jewell, to make it an ironclad bureaucratic mandate on all lands under her dominion. Furthermore, the NPS's outlandish claim that it has a legal mandate to lethally or otherwise remove cats from all properties under its purview is merely the tip of the proverbial iceberg when it comes to the feds' lawlessness in dealing with them and their caretakers. In reality, they do not recognize either any limitations or boundaries in the exercise of their self-anointed right to kill cats. 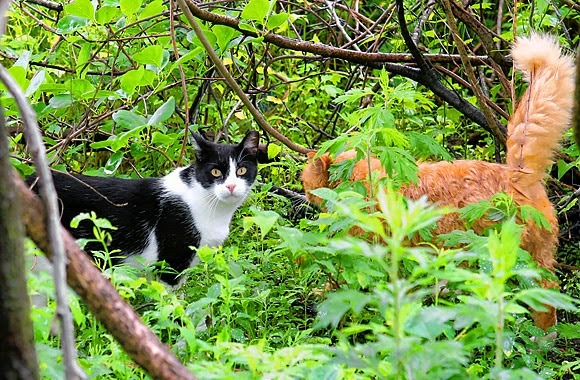 In 2008, for instance, agents from Wildlife Services sneaked into residential neighborhoods throughout Key Largo and, presumably, elsewhere in the Florida Keys where they illegally trapped and killed dozens of cats. "They went into neighborhoods looking for cats. They didn't care where they went," Dave Gable, a welder on Garden Cove Drive who had six of his cats stolen and killed by the agency, told the Florida Keys Reporter of Key Largo on May 8th of this year. (See "Key Largo Man Says Feds Unfairly Targeting His Cats to Save Woodrat.") "They killed them all." In its latest round of illegal seizures and killings intended to rid the Keys in general and Crocodile Lake National Wildlife Refuge in particular of cats, the USFWS has been trapping them in both Dangy Johnson Key Largo Hammock Botanical State Park and on private property as well. For example, on April 23rd the agency illegally trapped a cat named Rocky belonging to world famous scuba diver Captain Spencer C. Slate of Garden Cove Drive in Key Largo. When it is not actually killing cats outright, the USFWS occupies itself funding bogus, anti-feline research by the likes of the Smithsonian, Stanley Temple of the University of Wisconsin at Madison, and others. It also gallivants all across the country preaching its inveterate hatred of both cats and TNR to either anyone or group fool enough to lend it an ear. Even if Congress were to belatedly enact a statute designed to legalize the outrageous power grabs made by its buddies within the NPS and other federal agencies, that would not necessarily be the end of the matter. For example, back in 2006 Fresno's big-shot mayor, Alan Autry, ordered his goons within the police department to destroy a homeless encampment occupied by Pamela Kincaid and others. The high-strutting Stürmtruppen not only demolished their tents but while they were at it they confiscated and subsequently destroyed an undisclosed number of kittens, clothing, tools, identification cards, governmental documents, family photographs, and even the cremated ashes of a deceased person. San Francisco attorney Paul Alexander of Heller Ehrman, The Lawyers' Committee for Civil Rights, and the ACLU Foundation of Northern California in turn sued the city in United States District Court of Fresno where they were able to convince presiding Judge Oliver W. Wanger that the cops' theft of the personal property of the down-and-outers violated the just compensation clause of the Fifth Amendment. 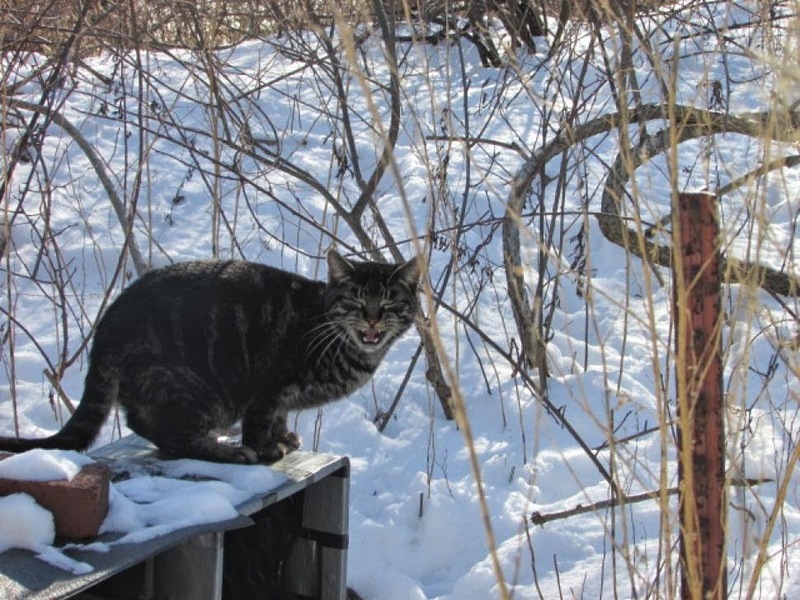 Applied to the situation in Plum Beach, the cats were the de facto personal property of their caretakers as were their shelters, feeding stations, food, water, and other personal effects. The NPS is accordingly guilty of a gross violation of the just compensation clause. As a matter of purely bureaucratic policy, it may have had the authority to order the cats' removal but it had absolutely no legal right under the Constitution to steal either them or the personal belongings of their caretakers. Any other interpretation of events would make a complete mockery of the just compensation clause. In particular, it would grant federal officials the authority to not only rob but to possibly even kill individuals who either wittingly or unwittingly set foot on federal properties, including highways, where their presence is not wanted. The NPS's fifth outrageous lie is that is only learned of the cats' presence in May. Actually, it and other federal agencies had known about the colony from the very beginning. The NPS's actions in Plum Beach therefore need to be viewed in light of the feds' all-out war against cats. Whereas the USFWS is the main protagonist in this battle, it receives plenty of assistance from Wildlife Services, APHIS, and the United States Forest Service. Vivisectors at governmental laboratories carve up and torture to death countless cats each year during the course of their utterly worthless experiments. The feds likewise generously fund universities to butcher even more of them. The common denominators in the feds' war on cats are easily recognizable regardless of whether the agency doing the maligning and killing is the NPS or some other entity. Most noticeably, all of them are first and foremost welfare bums who finance their atrocities with the tax dollars paid to them by the masses, including cat owners and advocates. Secondly, their anti-cat diatribes, which they ludicrously pass off as science, are concocted by inveterate liars who do not have so much as a scintilla of either objectivity or honesty. Thirdly, all of the aforementioned federal agencies do the bidding of ornithologists and wildlife biologists while cat advocacy groups are completely excluded from the decision-making process. Their outrageous lies and crimes are in turn endorsed by and peddled to the public by such utterly reprehensible and phony-baloney animal rights groups as PETA and the Humane Society of the United States (HSUS). The feds also benefit mightily from the uncritical support that they receive from not only The New York Times but the Washington Post, the Orlando Sentinel, USA Today, and other unscrupulous media outlets who care absolutely nothing about either objectivity or the truth. As reprehensible as all of that is, this story is concerned with considerably more than the lies and ruthlessness of the NPS. It likewise is about much more than the injustice of their eviction. It even entails a good deal more than the steadfastness and dedication of their heroic caretakers who through their actions have proven once again that it is precisely they and other like them who constitute the heart, soul, backbone, and financial lifeblood of the feline protection movement; all others are impostors. Whereas all of those groups and elements have come to dominate center stage in this debate, none of that alters the salient fact that this story is first and last about thirty-three long-suffering and noble cats, each of whom has a personality and a history. Most prominent among them is a cat named Rusty who cruelly and unconscionably was dumped at Plum Beach more than a decade ago. Then there is Patches who, although born into the colony, is descended from parents who, like Rusty, were themselves abandoned. Over the years Rusty and Patches struck up a friendship and now they are inseparable. Although it is not known if Rogers was able to trap and remove both of them, hopefully that proved to be the case and they are still together today at their new home. 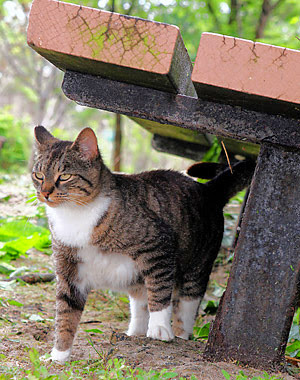 There also is Blondie, a shy brown and white domesticated cat, who was dumped at the colony three years ago. Both Boots, a friendly tortoiseshell, and Itsy-Bitsy, a brown cat with black markings, would make wonderful companions. All of the remaining cats have stories also that desperately need to be told but, malheureusement, the pertinent information regarding their lives has not been publicly divulged. Moreover, now that they are gone it is highly unlikely that the world ever will get the opportunity to either meet them or to even come to know that they once graced the face of the earth. As far as homes go, Plum Beach was not any great shakes under any circumstances. The area is exposed, cold, windy, wet, and subject to erosion. It nevertheless was the only home that most of the cats ever had known and anyone who knows anything about the species fully realizes only too well that turf is everything to a cat. As an old Sprichwort maintains, dogs belong to people but cats belong to places. The cats, however, have lost so much more than their beloved home in that they no longer have their devoted caretakers. One of them, Carolyn Euvino, not only had looked after them for the past eleven years but she spent $30,000 out of her own pocket in order to have them sterilized. Needless to say, individuals like her do not grow on trees. "When the snow was waist-high this winter, we took a $120 cab to come feed the cats," she disclosed to the Brooklyn Daily in the June 13th article cited supra. "I'm a 'crazy cat lady'." All of that is now a thing of the past. The cats have been uprooted, trapped, bandied about, poked and probed by veterinarians, and finally shanghaied to a new and strange location. The psychological and emotional wringer that they have been put through could not possibly have been anything short of frightening and traumatic. In spite of all the simply diabolical brain experiments that vivisectors all across the world have performed on cats, not a great deal is known about how they deal with stress, death, and the loss of loved ones. It is strongly suspected, however, that their minds work pretty much the same as those of their human counterparts. With that being the case, the best that can be hoped is that the Plum Beach cats somehow will be able to find the emotional resources that they are so desperately going to need in order to cope with what Charles Dickens euphemistically would have called their "reduced circumstances." Euvino, Rogers, and their other faithful caretakers also are undoubtedly going to terribly miss seeing and caring for them. Anyone even remotely involved in rescuing cats fully realizes that there are not any lulls in the struggle. New arrivals are constantly turning up and their urgent needs must be promptly addressed. In spite of all of that, it is sincerely hoped that the volunteers will not completely forget all about the cats but rather will find the time in order to occasionally visit them. It might still be feasible even at this late date for them to belatedly place some of them in loving homes. Although the original online fundraising appeal ended on July 6th, it is still possible for donations to be made to Rogers at K9Kastle@gmail.com. Such donations will go a long way toward ensuring not only the continued care of those cats that have been evacuated but also to attend to those either inadvertently left behind or destined to be abandoned on Plum Beach in the future. The evil designs of the NPS and its many allies can only be checkmated when fans of the species emulate the sterling example set by the volunteers and open up both their hearts and wallets and give generously. Neither the cats themselves nor their wonderfully dedicated and caring guardians are deserving of anything less. Photos: Steve Solomonson of the Brooklyn Daily (Sign, Rogers, Rusty and Patches, Blondie, Boots, Itsy-Bitsy, and Euvino) and Nancy Rogers (caged cats and an unidentified cat).